← A Ruble for Your Thoughts, Comrade Trump? Image | This entry was posted in Little-Kremlin-on-the-Potomac. Bookmark the permalink. I wonder if 45 will break with tradition and keep this gift from a head of state on his desk? He’s such a rebel. Seriously, I’m sure (hope) there are a lot of high ranking people in our military that are quieter than usual today. Talk about a conflict of interests. I bet the Roosevelt Room is all abuzz with nested panic attacks, twisted brainstormin’ and crikey communications consultants all with a yummy all-day Czarist buffet . . . I hope DHS takes this ball apart to check for bugs. Everyone knows this idiot talks too much. 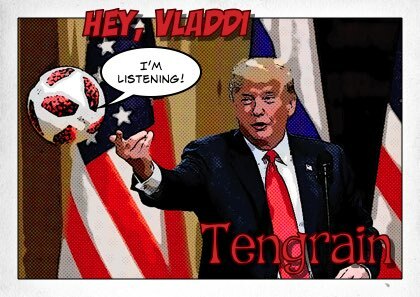 FatNixon’s soul for a soccer ball? Putin overpaid. Putin chats regularly with his puppet by phone. The puppet blabs constantly and Putin is an expert at extracting info from stoolies and stooges. There is zero chance we have any state secrets left that were ever divulged to the Orange Shitstain to begin with. I really hope there is a deep state that just puts comicbook-level fiction in his briefings since he’d never know the difference. Oh no not the secret of our X-men!!!! !1!